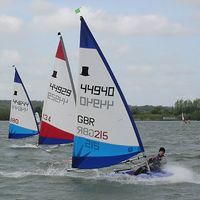 The Topper is an 11 foot sailing dinghy designed by Ian Proctor. The Topper is a one-design boat sailed mostly around Ireland and the United Kingdom. It was recognised as an International class by the International Sailing Federation (ISAF). The boat is constructed from polypropylene, and is popular as a racing boat or for sail training.